Three months, three Eagle Scouts - Troop 50 can celebrate the addition of another Eagle to our ranks as Daniel Meadows passed his Board of Review before the Saugahatchee District Eagle Board. Daniel began his scouting career as a Cub Scout, earning his Arrow of Light, before joining Troop 218. He has held numerous leadership positions in Scouting and is a Brotherhood member of the Order of the Arrow. 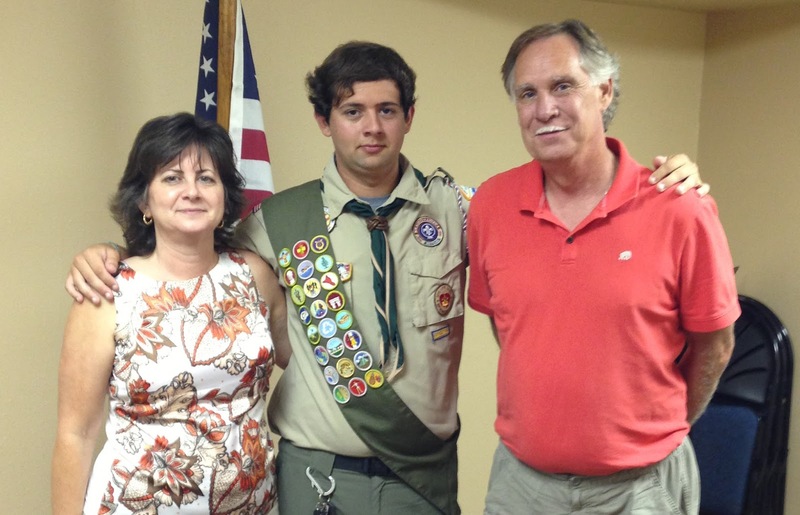 He joined Troop 50 as a founding member last fall. Our congratulations to Daniel on a great accomplishment. For his Eagle Service Project, Daniel renovated a wooden tower at Opelika High School that is used by the band director to instruct the school's marching band. The tower was pressure-washed and repaired before receiving a new coat of stain and a built-in table. The Eagle Board also approved another Eagle project for our troop. Vincent appeared before the board to present his proposal for a bee enclosure at the Forest Ecology Preserve. With two new Eagle projects now ready to launch, it appears we will soon have more additions to our list of Eagle Scouts.